If you currently drive a gas-hungry vehicle, the time to consider replacing it with a more efficient one is before gas-hungry vehicles become virtually worthless overnight – as would happen if gas prices head south of $4 per gallon. People who are driving 17 mpg SUVs and pick-ups when gas prices suddenly spike will be left holding the keys to vehicles almost no one else wants, either. Meanwhile, it’ll be a seller’s market for fuel-efficient cars. Those who don’t have one will have to pay top dollar to get one. Act pre-emotively and you’ll come out on top. Fail to act and you’ll be stuck with a vehicle that may cost $100 to fill-up that isn’t worth a third of what you paid for it. If you absolutely must have a truck because of the work that you do or the area where you live, consider buying a diesel-powered pick-up to replace your gas-burning one. 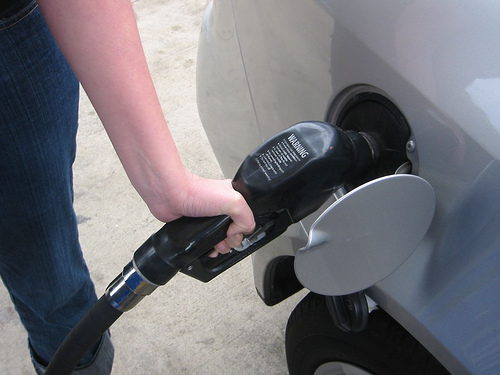 It’s true diesels cost more to buy – and the fuel is often more expensive than gas. But at $4 or $5 per gallon, the economics of owning a diesel truck that gets 30 mpg vs. a gas truck that’s in the teens back flips in your favor. Plus, a diesel-powered vehicle can last two or three times as long as an otherwise similar gas-powered vehicle. If you only have to buy a new vehicle once every ten or 12 years vs. once every eight or so, that’ll save you some bucks, too. Some families have more vehicles than people. That’s fine, provided you can easily afford all those vehicles – and not just the cost to feed them fuel. People often forget all the peripheral costs of ownership, like insurance, taxes and, of course, necessary maintenance. If you keep multiple vehicles, the total costs can end up being quite high – even if you’re not actually driving the cars much. If you can get by with two cars instead of three – or one car instead of two – the savings now can be considerable. And they’ll be even more so in a world of $4 gasoline. Another savvy move is to cash out the equity you may have in excess vehicles. By selling off a surplus car or two, you can sock away several thousand dollars – which could come in very handy on the day that fuel prices rocket to a buck (or three) more per gallon than they are right now. Investing in a low-bucks used economy car is another smart move. The glitter surrounding a new electric car or hybrid may be dazzling – but it’ll take many years to work off the cost ($41k for a new Chevy Volt) of buying one, even at $4 or $5 per gallon. A $4,000 used Corolla that gets 35 miles per gallon could ease the pinch of $50 fill-ups considerably. Many of us spend two hours (or more) every workday getting from home to our jobs and back home again. We bought into this because of the math. The lower cost of living in the ‘burbs offset the cost of fuel spent commuting, etc… Well, it used to. But the equation changes when gas prices double or triple. All of a sudden, instead of spending $40 per week for fuel, you might be spending $80. For many families, the additional unexpected expense might be the straw that breaks the camel’s back. And there’s a double-whammy involved. Once gas prices sail past $4 per gallon, those far-flung suburban homes become less and less desirable – and their value falls. This is already happening. But if we get to $4 or $5 fuel, the downturn in the housing market could become a collapse. Few people can afford a big mortgage – and $400 per month for gas on top of it. So if you’re already close to the edge, money-wise, and know that a significant increase in your commuting costs could put extreme stress on your budget – begin thinking about options before a theoretical risk becomes an immediate crisis. Ask about telecommuting (if possible). Discuss ride-sharing with co-workers and friends. Maybe even consider moving closer to where you work. Once we get to $4 or $5 gas, your options will not be nearly as good as they are now. None of us can control the cost of fuel; if the sign says $4 per gallon and we need to fill up, that’s what we’ll pay. However, we do have control over other expenses. And we can compensate for increased energy costs by reducing what we spend on other things. Many of us, for example, could easily get by without things like video cell phones and PDAs. Sure, electronic gadgets are fun – and handy. But the question should be: Are they necessary? And if the answer is “no” then the next question ought to be: Do I prefer having some money in the bank to cushion against possible upticks in energy costs (which can’t be evaded) or am I willing to risk being strapped for money if that happens in order to have the gadgets I want but don’t really need? One last thing. Did you know that in most cases you can save money on your car insurance if you take an online traffic school class or defensive driving course? It works perfect for people with bad driving records and there are even comedy traffic schools online to make taking a class even easier. The more money you have in the bank – and the lower your monthly expenses for other things – the less $4 or even $5 per gallon fuel can hurt you.